Chichen-Itza was the capital of the ancient Mayan imperial and is an impressive sight even if you are not a history buff. It is considered one the the 7 Wonders of the Modern World. 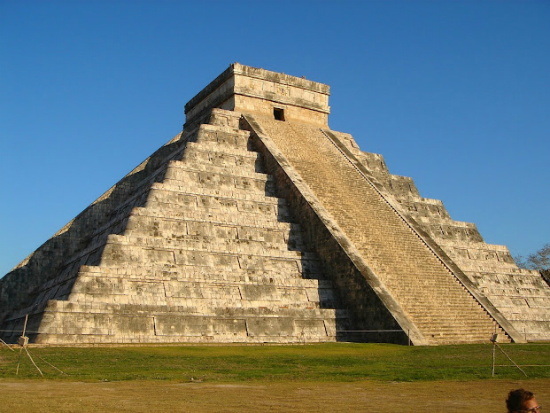 The 75 foot Kukulkan pyramid is the main structure on the site, but other important ones are the Temple of Warriors, the Ball Court and the Observatory. Make sure to check out the cenote on site, considered a sacred well where allegedly many victims were sacrificed to appease the Mayan Gods. Your tour guide will teach you about the Mayan culture and the history of the ruins. You will also have free time on site to explore at your own pace and take your pictures, of course! In addition to your visit to Chichen Itza, this tour includes a stop at a cenote, where you can take a quick dip in what the Mayan’s believed were rejuvenating waters. This tour includes your lunch. If you prefer a private tour to Chichen Itza, just contact us. We can help you, just contact us. Please note that since 2006, you are no longer permitted to climb the pyramid. If you want a pyramid to climb, check out Coba or Ek Balam. INCLUDES: Round trip transportation, entrance fees and tour guide services. Also includes lunch (no drinks). HINTS AND TIPS: Comfortable walking shoes, a water bottle, hat, sunglasses and biodegradable sunscreen. You may want to wear your swimsuit under your clothes and bring a towel if you decide to take a dip during your cenote stop. Bring along extra money for snacks, drinks, souvenirs or to tip your guide. KIDS: This is a long day for most children as the transport is at least 3 hours each way. Bring along a portable DVD, games, books and other entertainment for the kids. The Chichen Itza site is stroller friendly for the most part, but the steps descending to the cenote stop must be descended on foot. No life jackets are provided for the cenote swim so bring along for kids. Kids price from 4-11 years. WHEELCHAIR: The Chichen Itza site is easily accessed in a wheelchair, however, the steps descending to the cenote stop must be descended on foot. The buses do not have wheelchair lifts so wheelchair must be collapsible and guests assisted on and off the bus. Additional costs: Snacks and drinks. Souvenirs.